Welcome to EasySynth! This detailed guide will walk you through each tab, describing all of the controls. Hints are provided along the way so you can get the most out of this great synthesizer. Selects a sound from the list of predefined or previously saved sounds. Email or send the sound to bluetooth, Dropbox and other file shares. Monophonic – only one note will ever be played. Instruments like horns and flutes are monophonic. 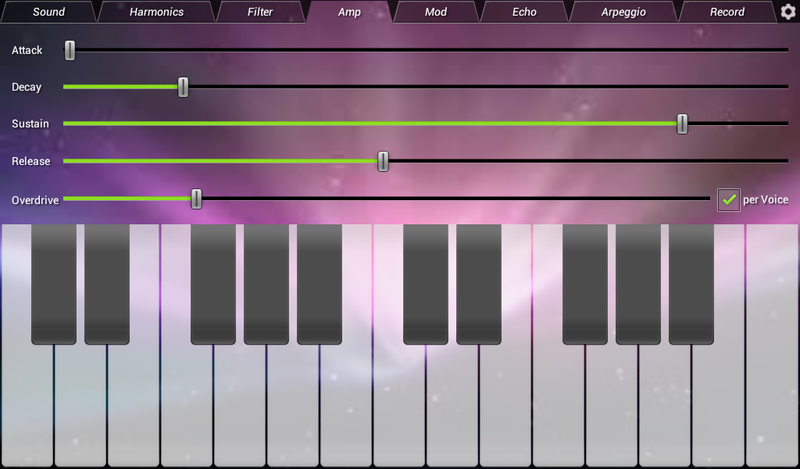 Polyphonic – Multiple notes can be played by pressing multiple keys, like on a piano or organ. Chorus – Four of the same note are played at the same time for a chorus effect. For chorused voices, this controls the slight difference between the frequency of the different voices. For monophonic voice, this controls if the sound changes smoothly between notes when you glide your finger across the keyboard. A natural instrument with portamento is a trombone. What parameter is changed based on key-down velocity. Can be none, volume, filter, or both. For the on-screen keyboard, velocity is simulated by where you press the key (higher up is higher velocity). What parameter is changed when the expression is changed. Can be none, volume, filter, or vibrato. Expression is changed by moving your finger up and down on a key for the on-screen keyboard. For MIDI, this is the expression knob. Chooses the pitch of the notes played on the keyboard. At 4, the middle key is “C4”, or the middle key on a piano. When selected, a pressed key will remain pressed until another key is pressed (for monophonic and chorused) or the key is pressed again (for polyphonic). The key of the instrument. This transposes the keyboard from its natural position of C to any other key to make it easy to play in other keys. You can modify and save a predefined sound. To restore back to the original, just “delete” the sound and the original will be restored. 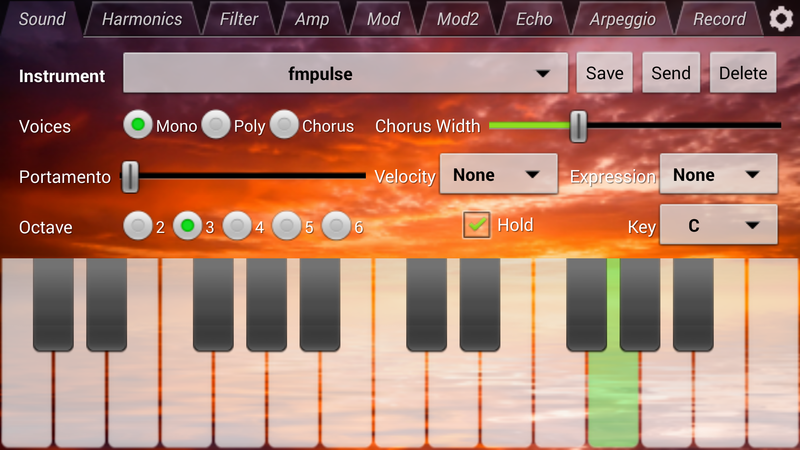 Other users can play your emailed sounds with a free version of EasySynth. The same instrument can sound very different when played monophonic, polyphonic, or chorused. And, when chorused, the chorus width also makes chorus sound very different. Experiment around with it! Octave and key is remembered with the instrument when it is saved. 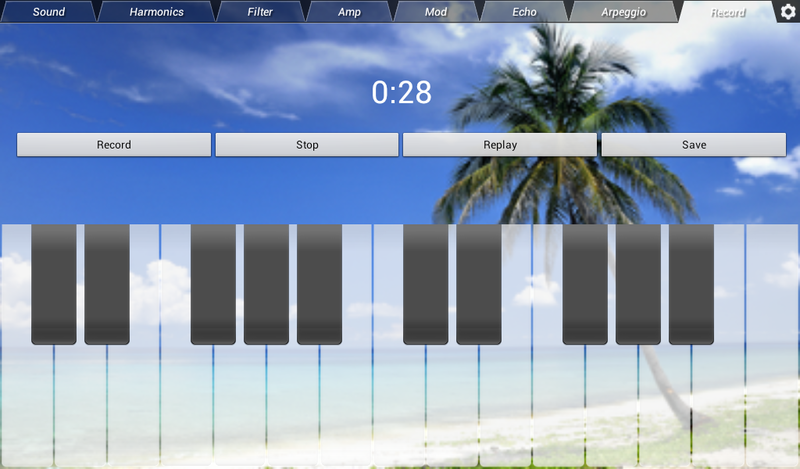 This allows the keyboard to shift naturally to the best range and key for the instrument when changing instruments. 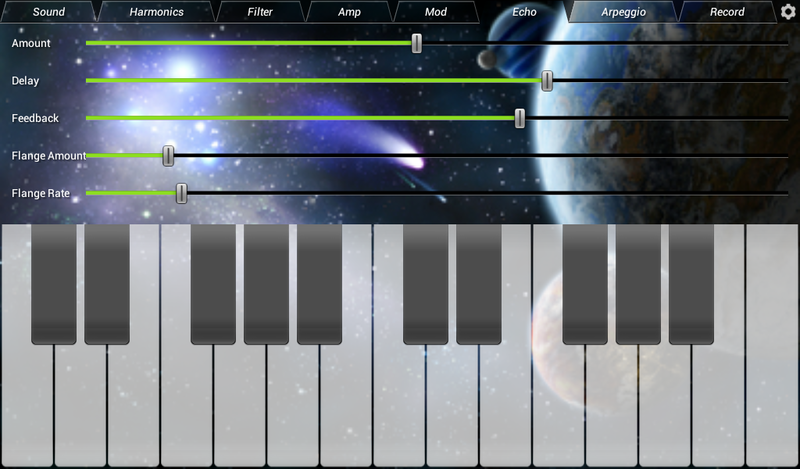 The harmonics tab allows you to adjust the basic sound of the instrument. It is very similar to the stops on an organ. It also replaces the oscillators of other synthesizers. Synthesizers usually allow you to choose from several different waveforms on multiple oscillators. Choosing harmonics can produce any of those same waveforms as well as most of the effects of multiple oscillators, and much more! 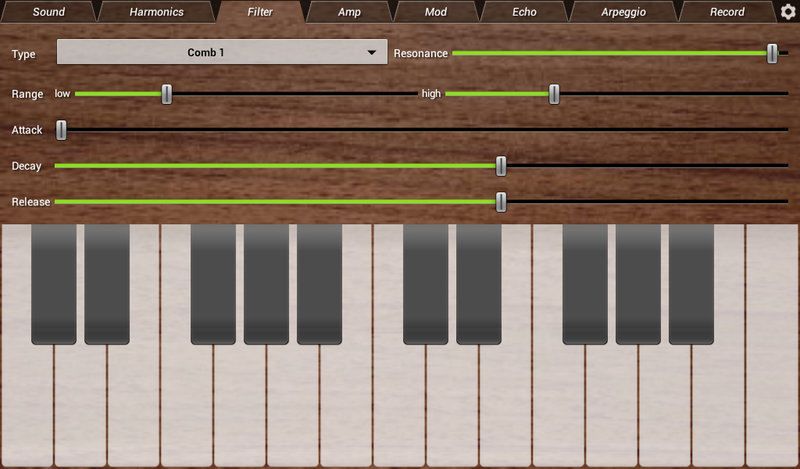 Look at the built-in instruments to get an idea of what some of the harmonics combinations sound like. A flute has only one harmonic (harmonic 1). A reed instrument has every-other harmonic. Guitars have two harmonics on, then two harmonics off, etc. Subharmonics can be simulated. What you do is consider harmonics 2,4,6,8 etc to be harmonics 1,2,3,4 of the instrument. Then use harmonic 1 as the subharmonic. Harmonic 3 can also be slightly added in to give a sub-subharmonic sound. See the piano for an example. A “perfect-fifth” duet sound can be created as well using the doubled-harmonic trick. Blend the doubled harmonics of the instrument and it's perfect-fifth counterpart, shifted one harmonic higher. For instance, if the harmonics are 1,3,5,7, you would use doubled harmonics 2,6,10,14, and then add the doubled perfect-fifth counterpart of 3,9,15,21. The total harmonic volume is auto-adjusted. This means that if you have the highest harmonics at ½ volume, the volume of all harmonics will be doubled automatically. So, don't try to use the harmonics to adjust global volume.. it won't work. The filter changes the volume of the different harmonics over time. This allows for a reshaping of the sound timbre which happens naturally in some instruments, either subtly such as a piano or more pronounced like the human voice. But perhaps best of all, it allows the truly bizarre sounds we've all come to know from electronic music. The type of filtering: low pass, band pass, high pass, fad, comb1-comb4, formant1-format4. See below for the meaning and use of each. The amount of the filtering effect. The cutoff and peak of the filter. The low is where the 'center' of the filtering begins, the high is where it is at it's peak. The rate at which the filter moves from its low to its high when a key is pressed. The rate at which the filter drops from its high to its low after reaching the high, and the key is still pressed. The rate at which the filter drops to its low after the key is released. There are quite a few filtering types – probably more than most synthesizers. Here's a more detailed description of each so you can start to understand them. This filter lets low frequencies through and cuts off high frequencies. At its lowest range and highest resonance, only harmonic 1 will be let through and all harmonics eliminated. Then, as it moves to its high range, higher harmonics are added in. The low pass filter is the classic analog synthesizer filter, and is the best filter to use to get that classic synth sound. This filter lets middle frequencies through. At its highest resonance, only one harmonic will sound, all others will be quieted. And, just like the low pass filter, the lowest range will have harmonic 1 being the loudest, and highest range will have harmonic 32 loudest. This filter is the opposite of low pass, letting all frequencies through at the lowest range and only the highest harmonics through on its highest range. This filter lowers higher frequencies at its lowest range, like turning down the tone or treble knob on a radio. Plucked string instruments sometimes have this fading quality, as well as simple modulation in an FM synthesizer. These filters choose to pass or reduce the volume of harmonics as they move up, like the teeth of a comb (thus their name). Comb1 passes four harmonics, then reduces four, then passes four, etc. Comb2 passes three, reduces three, passes three, etc. Comb3 passes two, reduces two, passes two, etc. Comb3 passes one, reduces one, passes one, etc. The range of these filters shifts the position of the harmonics that are filtered. At the lowest range, the first harmonics are passed. At the highest range, the first harmonics are reduced. By moving a comb filter over time, the sound seems to “shimmer” or “ring”. These effects are similar to of tuning of modulating oscillators in an FM synthesizer. The resonance controls the amount of the reduction of the volume of harmonics and thus the amount of this effect. These filters mimic the acoustics of the human vocal track. As such you get really weird effects that sound like people mumbling or wailing. They can also sound like other mammals. Each of these filters consists of three band-pass filters. The difference in them is how the filters are moved over the range of the filter. Experiment with them to see what sounds good. Attack, Decay, and Release are often referred to as the envelope of the filter. There are also envelope controls on the amp and the vibrato. If there seems to be a long delay before the filter takes effect after pressing or releasing a key, try changing the Range – high setting. It is probably too high. This is especially true if you are using low, band, or high pass filters and there are few high harmonics. Filtering on a single harmonic or very few harmonics will be difficult to detect, so it is best to use quite a few harmonics, even if at low levels, to hear the filter's effect. Formant filters usually sound best with harmonics that are fairly full in the low range (from harmonic 1 through 8). The amp controls change the overall volume of the instrument over time. This is know as the instruments envelope. It also allows for an overdrive effect, like is possible with guitar amplifiers. The rate at which the volume will initially increase when a key is pressed. All the way down will be immediately high volume (like piano). Higher will fade the sound in, like a soft violin or the wind building. The rate at which the volume decreases after reaching its peak and the key is still pressed. The volume at which the note will continue to sound even after it has decayed, which the key is still pressed. The rate at which the volume will drop to zero after the key has been released. This causes the sound volume to be clipped or flattenned at its highs and lows. The result will sound like harsher, and more of a hard-rock sound. This changes how the overdrive works for polyphonic instruments. If checked, the overdrive will be done on each note, then the sounds of all the notes are mixed together. If unchecked, the sounds of the notes are first mixed, then overdrive is applied. Setting the attack high will cause the sound to take a long time to build up in volume. You'll need to hold the key down for a long time to hear anything. Lowering attack, decay, sustain and release may make it hard to hear the note sound as it will be very quick (fast attack, fast decay/release with no sustain). However, that's the envelope used for many percussion instruments. A little overdrive goes a long way.. if you crank it up to high you'll loose all the harmonic and filtering effects. EasySynth's overdrive is smoothened when per-voice is not selected. This gives it a warmer sound, reminiscent of old-fashioned tube amplifiers. EasySynth's amp decays in a reverse exponential fashion. What this means is that the sound will get quieter slowly, having more of a “ping” to it and a more natural feel than some other synthesizers. Mod, or modulation, changes aspects of a note over time in a repetitive fashion. On some synthesizers this is referred to as Low Frequency Oscillation or LFO. The most typical modulation is vibrato, or changing of pitch. The human voice, an organ, and a violin are typically sung or played with some vibrato. EasySynth also uses vibrato for some interesting effects such as bending the tone of a note up or down, fading it in and out, or adding noise or ringing to the sound. The type of modulation: pitch (vibrato), amp (tremelo), filter (wa-wa). The shape of the modulation: wave, two-tone, ramp up, ramp down, noise, and several pulse sizes. The amount of the modulation. Lowest level is no modulation at all. The speed at which the modulation of the note changes. At low frequencies you can hear pitch change like a siren. At high frequencies the change will be ringing or noise. If checked, the rate of modulation will match be in sync with the frequency of the notes played. This produces true FM style modulation. The rate at which modulation moves from none to the amount specified with Amount once the key is pressed. If all the way down, the modulation is immediate. The rate at which modulation moves from its highest amount back to zero. If this is all the way up, the modulation never decays. Pitch – This changes the frequency of the note over time. Also known as vibrato. This is the most common form of modulation. Amp – This changes the volume over time. It is also known as tremelo. Filter – This changes the cutoff of the filter over time. It can produce a wa-wa style effect. Mod Pitch – (Mod2 only) This changes the frequency of the first modulator using the second modulator. This can create quite a few interesting sounds. It also allows emulation of a 3 operator FM synthesis algorithms. Mod Amp – (Mod2 only) This changes the amplitude of the first modulator using the second modulator. These types can be combined with different modulation shapes to form different effects. The shapes of modulation are explained below. This is a smooth up and down change. At slow rates (and high amount) on pitch, this sounds like the siren on a US emergency vehicle. At mid-rates, it sounds like a classic organ vibrato. At high rates this will cause a nice bell-ringing effect. When the modulation type is Amp, this fades the volume in and out smoothly, giving the classic tremelo sound. This is a high then immediately low change. With pitch vibrato at slow rates, this sounds like a siren on a European emergency vehicle. At mid rates it can sound like fluttering between two notes like on a flute. At very high rates it make a much harsher ringing effect. This starts low and moves up slowly to a higher level, then drops immediately to a low level and repeats. If used in combination with a decay, this can be used to ramp up the pitch of a note, like what happens on a trumpet. Otherwise, it can be used for some nice special effects. This is the opposite of ramp up, starting at a high level and slowly moving to a low level, then immediately back to high and repeating. With pitch modulation and a faster decay, this can make a good synth-drum sound. With amp modulation this can create a repeating pinging sound, as if echo were used. This is a random amount of level change. At slow rates this can make the sound bounce around in pitch, volume, or filtering like an old-style computer sound effect. At higher rates it adds noise. Pitch modulation is not the only way to add vibrato. You can also use portamento and glide your finger back and forth across the keyboard. The rate of modulation can be so high that it is higher in pitch than the note you are playing. When this happens it actually changes the harmonics of the note, leading to ringing sounds. With the sync turned on, the rate is made even higher and kept in sync with the note's frequency, producing FM synthesis. 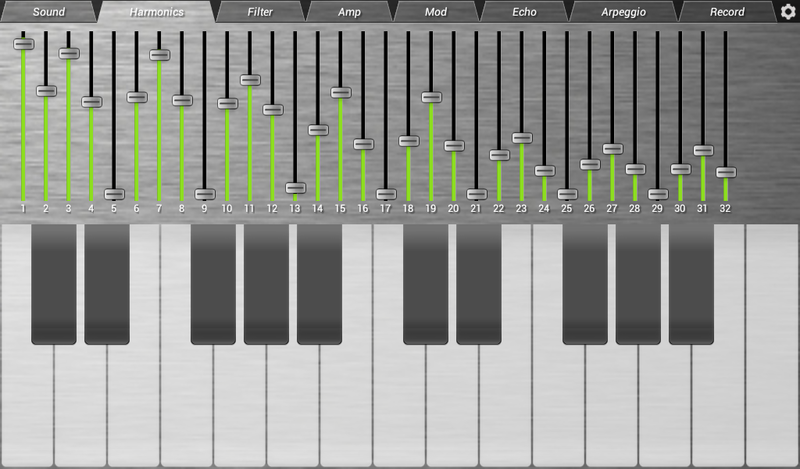 It is not as complicated as a true FM synthesizer, but it still allows for some cool sounds. 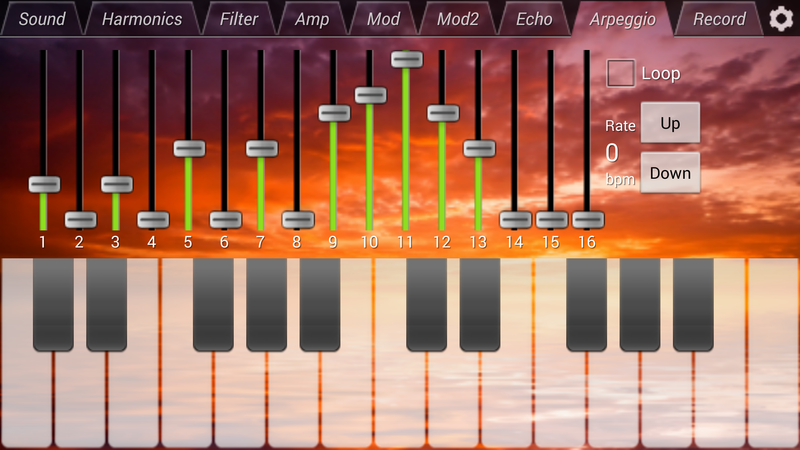 Experiment with noise and harmonic blends to find out the wide variety of noise effects that EasySynth can do. Starting a note with some vibrato then quickly decaying away will give the note a brass instrument sound. These are similar to two-tone except the time in which the modulator is in the “on” position is shorter. Check out the “Machine” and “Flings” instruments to see what this can do. Almost everywhere in life there are echos, whether we detect them or not. You can use the controls on this tab to simulate that effect, changing the simulated acoustics from a small room to a large music hall. You can also use the flanging to simulate duel stringed instruments and other delay effects. The volume of the echo heard. All the way up makes the echo exactly as loud as the original sound. The amount of time before the echo is heard. Very small amounts make the echo imperceptible (but are good for flanging). Very large values cause the echo to appear seconds after the original note. This is the amount of the echo that is refed into the delay to repeat the echoing. The amount of the flange. Flange is a repeating small change in the delay time. Small amount will make an interesting shimmer between the original and the delayed sound. Large amount will cause the echo to have a wave vibrato effect. The rate of the flanging oscillation. Small amounts are best for a shimmery effect. Large amounts cause an echo growl. A duet effect can be made by setting the echo amount to its highest level, adding a small delay, no feedback, and a moderate flange. This can be used to give a small chorus effect even when using polyphonic voice setting. Dueled stringed instruments, such as piano and twelve string guitars can be simulated this way. Echoes are stereo so, use headphones (not too loud!) and enjoy the effect. A moderate amount of echo can give life to an instrument's sound and fill the stereo space. 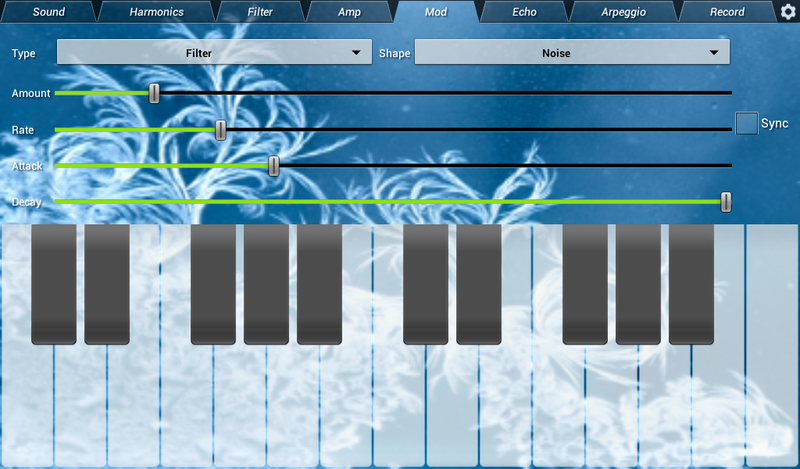 Sequencer allows a small sequence of notes to automatically play every time you click on a key. This can be used to make it easy to play a little tune or to form fast glissandos. These are the pitches of each of the steps in the sequence. If the slider is all the way down, the step is silent. If the slider is in the middle, it matches the pitch of the note played. The speed of the sequence in beats-per-minute (bpm). Use the Up and Down buttons to change the speed. If set to zero, no sequence effect is used. If checked, the sequence will play over and over again. If not checked, the sequence will only play once each time a key is pressed. If the instrument is polyphonic, an arpeggio will sustain keys beyond the original step. If it is monophonic or chorus, the next step will stop the sounding of the previous step. A long sustain with a fast arpeggio will blur the notes together, like the strumming of a guitar. Portamento is not taken into consideration during an arpeggio. Use the controls on this tab to record your performance (up to 5 minutes) and save it to a .wav file. Keep a record of your improvement in playing. Import them into another sampler-synthesizer. You'll find the recordings saved in a folder called EasySynth on your SD card. Use “My Files” or similar file manager app to find and work with the recordings. The settings dialog appears by clicking the gear icon in the upper-right. These settings are independent of the instrument. The number of keys displayed: 13, 20, 25 or 32. For most devices 25 keys works well. For small phones, you might want to choose 20 or 13 keys. For larger tablets 32 keys works well. It really depends on the size of your fingers and how you want to play. The image used for the backdrop of the synthesizer. The MIDI channel that the synthesizer listens to. 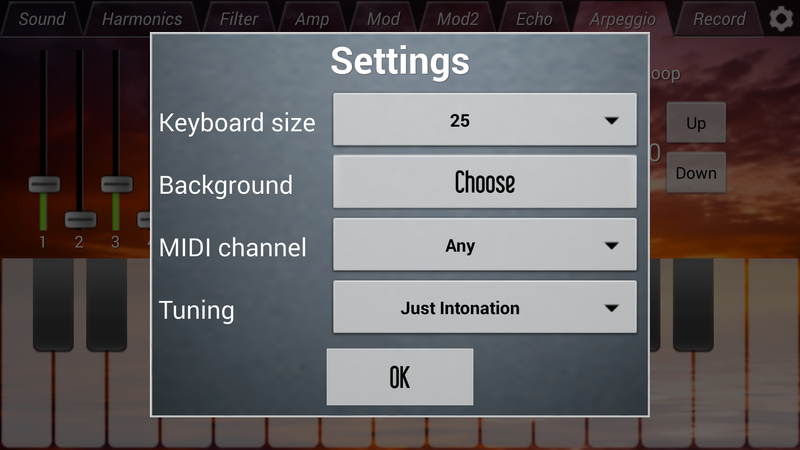 This should match the MIDI channel that your keyboard or other MIDI controller is sending on. The default value, Any, will respond to any MIDI channel. Equal Temperament – is a mathematically precise tuning used in most keyboards. Just Intonation – tunes the notes of the scale to be even fractions of certain harmonics. This reduces “throbbing” sounds for some instruments. Out of Tune – just for fun, this sounds like a badly tuned instrument! Enjoy EasySynth! If you have questions or suggestions, or want to share instruments feel free to email me at bj@gallantrealm.com.